On the Eighth day of our Christmas special I am taking you to a very special place in my life...Haworth. Being a huge Bronte fan and always dreaming of a white Christmas in the beautiful North of England..well... I just couldn't resist an old Yorkshire classic! Charlotte Bronte used to take this cake to the homes of her fathers parishioners and later her husbands. It was served with a slice of cheese and no home would be without it! This recipe dates from the early 1900s which is similar to the one Charlotte use to prepare. I've kept it in pounds and ounces for the sake of good old fashioned nostalgia! Crumble the yeast into a little warmed milk. Cover and let rise until frothy. Meanwhile put the flour and two teaspoons salt into a warm bowl. Rub in the butter, then add the risen yeast mix, and the rest of the warm milk and mix. Cover in a clean cloth and leave in a warm place to rise for 20mins. Once risen knead the dough like you would knead normal bread dough. The longer you knead the mix the lighter it will be so try and give it a good kneading! Rest for an hour longer letting it rise. Mix the dried fruit and eggs and add to the mixture. Mix it well through with your hands. Cover and leave to rise for another hour. Line 2 baking tins and fill two thirds of the way up with the mixture. If you don't want the middle to peak, hollow the mixture a little in the centre to achieve a level top. Bake for 1 hour (or until a knife comes out clean) in a moderate oven (around 160 degrees). Let the cake cool and remove from the tin...Then consume to your hearts delight! 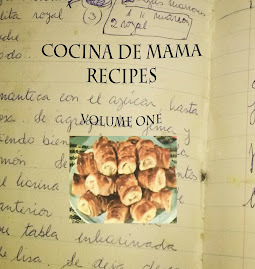 Don't forget to watch some of your favourite recipes on Cocina de Mama's YouTube Channel!